An interview with Louise Bielzer, professor of Communication and Strategic Management, about her study program International Eventmanagement here at Karlshochschule International University. Can you describe your International Eventmanagement program in three hashtags? Now the longer version. What is International Eventmanagement all about? The International Eventmanagement program aims to impart knowledge about how to strategically plan and implement international events and the various stakeholder perspectives on the related topics. This is all backed through references in relevant reading and current research. Depending on the personal interest students may put the focus on exhibitions, congresses, sports or cultural events. 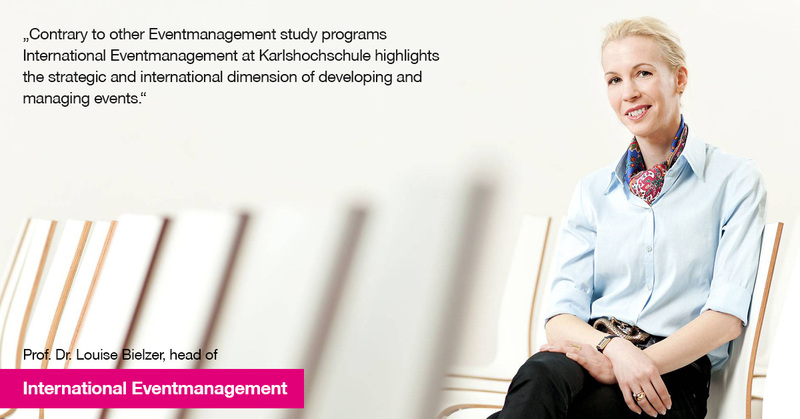 What is so special about studying International Eventmanagement at Karlshochschule? Contrary to other Event Management study programs International Eventmanagement at Karlshochschule highlights the strategic and international dimension of developing and managing events. Besides this, it also imparts knowledge about event locations and the interdependencies and impacts they have with and on their environment. Many students refer to the Companies Projects as most interesting modules because they allow them to gain practical experiences and to apply what they have learned on paper. A perfect complement seems to be the Research Colloquium related to current issues in international event management. Here, students may conduct own little research projects and get prepared for their bachelor thesis. Depending on your selection of foreign languages, specific areas of interest in the events industry, your internships and research topics you may develop a distinctive profile which allows you to find an interesting job in business and to be well-prepared for the challenges your first job may bring along. We look for motivated, well-informed young people with a strong will of working in the events industry. Applicants should be interested in social, economic and cultural developments, up to date about current news in general, and media coverage on events in particular. International experiences are an advantage. Hello I am interested in your program. Can you provide me further information? ?